Toasting Marshmallows at Uncle Wagner’s Camp! Our camp sat near the end of Burketown Road near the Miller’s old camp and Jack Camp’s old place. Jack Camp, a permanent resident, was the local coroner and constable, and kept an eye on things for those of us who owned summer camps in the area. Across the road was a camp that belonged to my Great Uncle Wagner and Aunt Betty. Uncle Wagner was my Grandfather Klippel’s older brother. My Nanny and Grandpa had a camp back down the road, closer to Burke’s Marina. Uncle Wagner’s camp has changed ownership since those days. This particular evening there were several younger family members sitting around the stone-encircled campfire in front of Uncle Wagner’s camp. There was myself, my younger brother, three cousins who were all boys, and two other cousins who were both girls. We probably ranged in ages from 8 to 15. And, we were having a grand time toasting marshmallows on sticks we had cut earlier from a nearby Beech tree. It was funny how some of us liked to see the marshmallows blaze, preferring them charred on the outside and melted on the inside. I preferred mine golden brown on the outside and warm in the middle. Therefore, I would concentrate a bit harder than some on the task at hand, selecting just the right nest of red hot coals, and turning the marshmallow constantly to get a nice even golden-brown color. I guess that is why I was the last one to notice that a black bear had come out of the woods, no doubt attracted by the enticing smell of burning marshmallows. I guess Aunt Betty must have heard the ruckus as we all started yelling and scattered to give the bear plenty of room. Aunt Betty to the Rescue! Aunt Betty was a short, stocky woman and not afraid of much that I can remember. Uncle Wagner, Aunt Betty, Grandpa and Nanny Klippel were sitting at the kitchen table in the camp playing Rummy 500. This was a favorite Adirondack evening pastime in our families. In addition, we also regularly enjoyed playing Pitch, Cribbage, and Pinochle. Family card games were a regular event. Our parents were across the road in our camp spending a quiet evening reading. I guess they probably needed a break from my brother and me. We could sometimes be a handful! Aunt Betty exploded through the screen door of their camp armed with a straw broom. 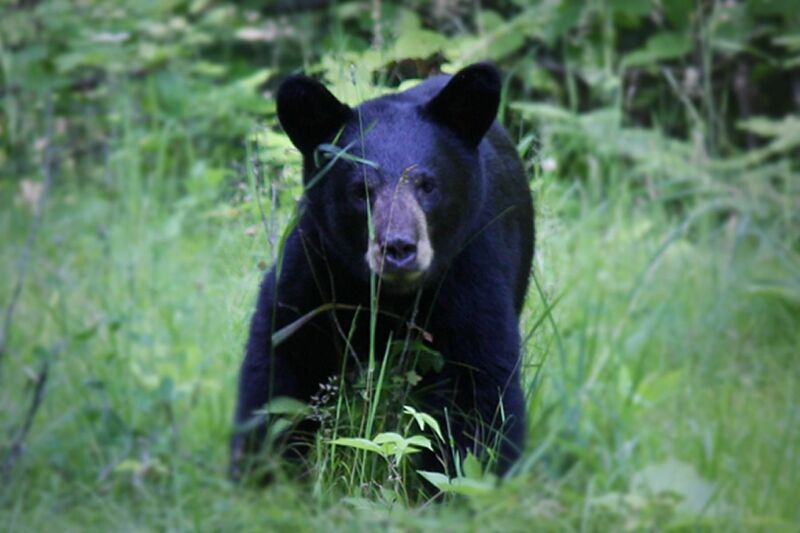 The black bear being young, maybe a little older than a yearling, did not know what he had unwittingly stumbled into. He just wanted marshmallows, but what he found was more like a stirred-up hornet’s nest. Wielded by Aunt Betty, the sweeping end of that broom attacked that poor bear from all angles at once and Betty let loose with a barrage of “Shoos, Scrams, and Git’s.” The bear quickly decided the marshmallows were definitely not worth the trouble, and took off just as fast as he could back into the woods letting loose with bawling sounds that were a cross between a bellow and a whine. All Well that Ends Well! All us kids were safe and sound. But, that incident ended any marshmallow toasting for the night as we were herded into their camp. Our parents, alarmed at the sudden change in the sounds coming from across the road, had appeared just as the bawling bear disappeared into the dark woods and quickly escorted us back across the road. We were soon settled in for the night up in the loft. I don’t think that bear ventured into our region of the Adirondack Park ever again.